If you wish to use these notes for your personal education, entertainment, and enlightenment, please do. I hope they're helpful. After numerous requests, I have bundled up these notes and published them in book form, both electronic and paper. 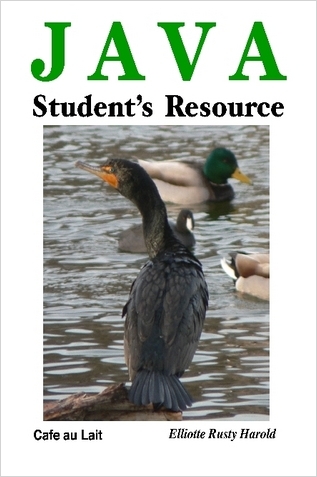 You can order a nicely printed copy of the notes entitled The Java Student's Resource from Lulu.com. A PDF is $19.95. A perfect-bound, printed copy is $35.90. All major credit cards are accepted. The book version contains essentially all the content you'll find here with the exception of a few very Poly-specific details like which room the class meets in and the date and format of the final exam. The printed book is not available from other retailers such as Amazon. I thought about making it available there, but the tyrannies of ISBN numbers would have kept me from updating it as frequently as I like. Lulu doesn't tell me who ordered the book, but if you drop me an e-mail after you've ordered it, I'll put you on a mailing list to receive free updated versions of the PDF as they're released, probably 2-4 times a year. I can send you a tar or zip archive of the HTML slides that you can adapt for your course. The same arrangement is available for most other non-profit institutions. If you would like to use, modify, or adapt these notes for a course taught by a training company or a for-profit university such as the DeVry schools, or for internal use within your company, I license the notes on a per-seat basis. Please send me all of the above (.edu address not required), plus the number of students expected, and I'll quote you a price. I may also ask you to send me the registration list for the class. Under no circumstances should you post these notes on any Internet servers visible to search engines or the public at large. This is the only official site.